"Exposure to excessive light at night, including extended use of various electronic media, can disrupt sleep or exacerbate sleep disorders, especially in children and adolescents. This effect can be minimized by using dim, [warm] lighting in the nighttime bedroom environment." ​–Recommendation from the American Medical Association, 2012. How Does Amber Light Improve Sleep? As numerous studies indicate, modern light sources (particularly fluorescent lights, laptops, and cellphone screens) contain a high level of blue light that disrupts melatonin production and throws off our natural circadian rhythms—keeping us awake when we should be sleeping. Many sleep specialists suggest that this widespread exposure to blue light, long after the sun has set, is a major contributor to the modern epidemic of insomnia. However, the amber-spectrum light emitted by firelight and candlelight demonstrates no negative effect on melatonin production. SomniLight amber sleep lamps and amber book lights are specially designed to mimic the amber-wavelength light of candlelight without sacrificing the safety and convenience of modern lighting, allowing you to fall asleep up to an hour faster. When using amber light is impractical (late night shift work, gaming, or computer use), amber glasses have been proven to block up to 99% of blue wavelengths, preserving your body's natural levels of melatonin. Our lights and lenses allow you to enjoy your evening—reading, writing, and relaxing—without the corresponding disruption in melatonin production caused by traditional light sources. In addition to potential sleep benefits, numerous studies suggest that a natural balance of serotonin and melatonin can result in a wide array of mood and health benefits. Finally, the same blue wavelengths that cause insomnia have also been proven to trigger eye strain, photophobia, and migraines. Multiple independent studies have demonstrated that red migraine glasses can reduce the occurrence of chronic migraines by up to 74% and alleviate migraine pain in as little as 10 seconds. Read reviews of SomniLight Amber Book Lights, Amber Glasses, and Migraine Glasses here. Read the latest research about Blue Light and Insomnia, Night Shift Disorder, Red Migraine Glasses, Melatonin and Cancer, ADHD Insomnia, Low-blue Nursery Lamps, and Red lenses for cone disorders. Purchase our Amber Book Lights, Amber Sleep Lamps, Amber Nursery Lamps, Red Night Lights, Amber Sleep Glasses, FL-41 Glasses, and Photophobia Glasses here. Our circadian rhythms (internal clocks) are regulated almost entirely by lighting cues. Bright, white light tells our bodies it’s daytime, while dim, warm light lets our bodies know it’s time to sleep.  The right kind of light exposure can help establish consistent sleep schedules and help prevent circadian disorders like insomnia, Delayed Sleep Phase Syndrome, and Seasonal Affective Disorder (SAD). Wake-up Mode. SomniLight Night and Day lamps feature a white “wake-up light” mode, with 6000K color temperature LEDs, that emit a high percentage of blue wavelengths to replicate the effect of morning and afternoon sunlight. When blue wavelengths from either natural or artificial sources hit our retinas, it sends a strong signal for our bodies to stop producing the sleep hormone melatonin and begin producing wakeful hormones like serotonin and cortisol. ​Wake-up mode should be used in the early morning and throughout the early afternoon to firmly establish this time as the beginning of the circadian cycle. Amber evening Mode. While blue light in the morning is essential for waking us up and beginning the circadian cycle, blue light at night can have an extremely detrimental effect on the circadian rhythm, leading to insomnia, Shift Work Sleep Disorder, and Delayed Sleep Phase Syndrome. Most modern lighting and communication devices emit a high percentage of blue wavelengths, leading to a modern uptick of insomnia and related sleep disorders. However, our bodies interpret amber light as “virtual darkness,” allowing for unimpeded, healthy melatonin production. Our amber sleep mode uses specially designed amber LEDs to produce a warm color-temperature light, similar to candlelight. Like candlelight, our amber lamps emit only long wavelength light (peaking at 592 nM), free from the blue wavelengths that can disrupt sleep. Both “wake up mode” and “amber evening mode” can be used independently to help prevent various circadian sleep disorders, though the most successful practices include consistent use of bright, white light in the morning and dim, amber light in the evening. Because melatonin, serotonin, and cortisol help regulate not only sleep but also mood, anxiety, and immune function, a properly attuned circadian rhythm is essential for general health and wellness. The Night and Day Lamp also features an optional red night light in the base of the lamp. This red night light can be used throughout the night, as red light has been demonstrated to have smallest interaction with melatonin production. A red night light is especially useful for children's rooms and nurseries. 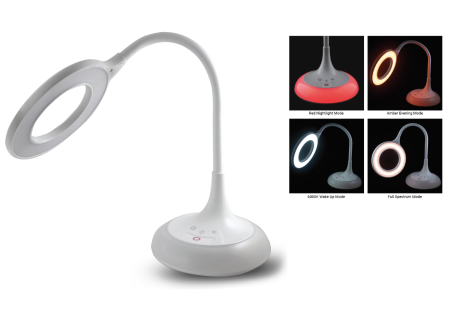 All lighting modes feature three brightness levels: dim, medium, and bright.